The goal of lighting a pool table is simply to get it to near perfect levels. There is no correct opinion on the topic as it will vary from person to person, home to home, and what they want to achieve in their room. Thus, in this guide we are going to discuss the general guidelines in which you should follow if you want to properly hang a pool table light above your table. These are really the only things you need to consider when choosing a light which will best fit once you hang it up, so none should be ignored and you should fully understand every point before buying a light. By reading through each specific point and putting it into consideration, you will be much more likely to end up with an optimal light setup which allows for the perfect amount of light to hit your billiards table. On top of that, you will choose the best fitting light for your room which will keep your room with a sense of flow and style. The official rules set by the World Pool-Billiard Association (WPA) state that if the fixture above the table may be moved, the minimum height of the fixture should not be lower than 40 inches above the bed of the table. Now if the light is non-movable, the fixture should not be lower than 65 inches above the bed of the table. With that said, you should take that with a grain of salt since most people aren’t typically following these strict rule sets. But, they are certainty a good guideline of how high you need to hang your pool table light above the bed of your table. We recommend that your light be no less than 40 inches above the bed of your table and no more than 70 inches. Of course if you can not meet these standards, do what you can. If your light is 38 inches above the table and it’s what you like, then this typically isn’t a major issue (and vice versa if it’s over 70 inches above the bed). The goal of a proper light height is to ensure no one hits their head on the light along with making sure its not in a blinding position. While the length of your billiard light isn’t directly related with hanging it, we thought it was a necessary point to add into this post as the length you should have will vary from table to table. And again, these are all general guidelines and can be altered to meet your own personal needs. A general guideline is that your light should be at least 12 inches in from the end of each side of the table. What this means is that your light should never be longer than your table, in fact it should be 24 inches shorter at a minimum than your table is (12 inches on each side). Now, we want you to understand that this is a very general guideline and doesn’t have to be met. It is simply a general guideline that allows for proper proportions of light length to table length (long ways). The only thing you never will want to do is have a light longer than your table, that is really it. For an example, let’s take a 7 foot table (84 inches). A very good light length for this sized table would be anything 60″ or below. Now, most lights are under this size so this is no issue. So, you may be wondering what about if you have a table larger than 7 feet (such as 8 or 9). In theory, a 9 foot table would suit any light 84″ or smaller. But sense most lights are below 60″ anyways, it’s kind of a useless number. Lastly, don’t be afraid of getting a light too small. This is virtually impossible, and as long as you get equal coverage of illumination over your table it will be fine. The WPA once again has some guidelines as to the amount of light that should be hitting the bed of your pool table. The numbers they give is that your tables bed in every spot should get 520 lux (48 footcandles). They say light should be equally spread on all parts of the table, and that the center should not have different amount of light than any other spot on the tables bed. Now, achieving such perfect illumination can be difficult but nothing with this process is set in stone. You also need to take into account the surrounding area and the light in it. The WPA says the background should have no less than 50 lux (5 footcandles) of light, which is significantly less than on the table. To measure lux, you can use apps on smartphones or buy a lux reader to get near perfect illumination hitting your table and throughout your game room. And to touch up on the type of light bulb to use, most players agree that a fluorescent bulb provides the most even lighting across the table which isn’t blinding and gives off a good color temperature. So if you can, try using fluorescent bulbs in your lights! As for physically hanging and wiring your new pool table light, you should hopefully get some installation guides with your purchase. Here on BilliardLux, all of our products come with easy to use installation guide for every single product. So whether you are a DIY type of person or hire a professional (which we always recommend), you can use the installation guide to get your light up and ready to use in no time. And of course if you ever run into troubles during installation of a light you buy from us, you can contact us and get a response within 24 hours (or less). Feeling confident with your ability to pick out a perfect light for your billiards room? 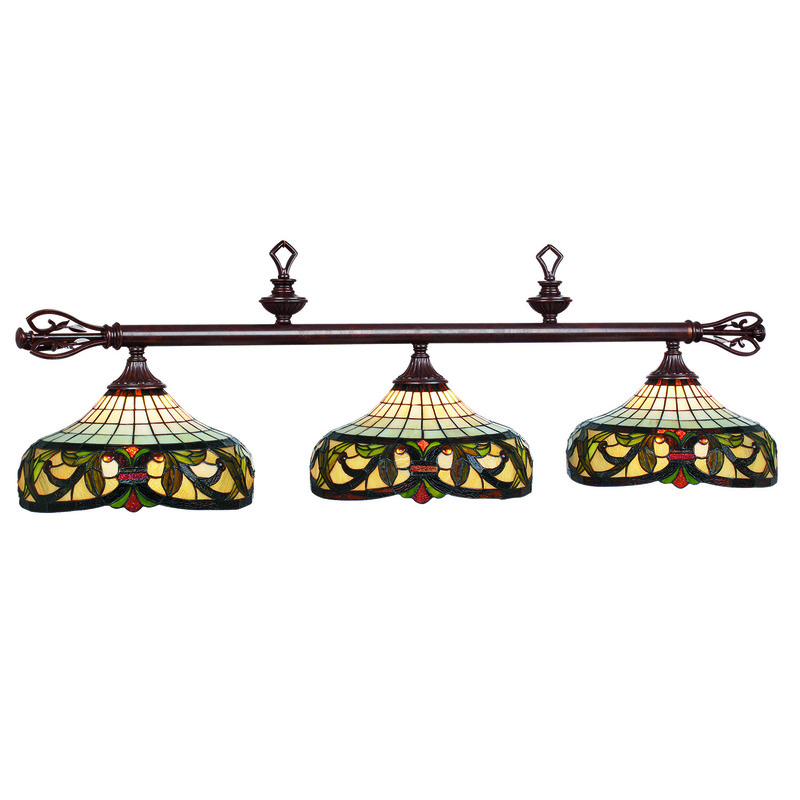 Explore 100+ fixtures that will illuminate your room in style. Not confident yet? Contact us and tell us why! This entry was posted in Billiard Lighting. Bookmark the permalink.